Boston Terrier is a small dog that has a big personality – he is very playful and friendly, even goofy at times. And because they have this good deal of energy and love to play, they will need a proper high-quality diet formulated for small-breed pets. You must be wondering what dog food is the right choice for your canine. Well, the meal must be made with high-quality ingredients, affordable, safe and compliant. What Should I Feed My Boston Terrier? How To Transition To New Food? More specifiable, it will also depend on the following: your budget, activity level of your furry friend, his weight, health, and age. Whether you’ve got boston terrier puppies, adults with food allergies and sensitive stomach, or the ones that are perfectly healthy, we’ve got the resource to help you find the perfect diet for him. The first product on our list is Taste of the Wild which has been specifically designed for puppies. Thanks to the high amount of protein in its formula, this is one of the tastiest and nutritious grain-free recipes on the market. Its primary protein sources are the roasted bison and venison which include the proper amount of amino acids, great for strong and lean muscles. As usual, this formula features all the minerals and vitamins needed for a healthy and happy growing puppy. The recipe also has added DHA that offers a balanced and complete nutrient-rich formula. This grain-free diet provides excellent nutrition and digestible energy for your growing furry friend. And what’s great, the fruits and vegetables deliver antioxidants to help support a happy and healthy lifestyle. This dog food for small breed puppy includes Salmon Meal, Oatmeal, and Turkey to support the unique health needs of your little four-legged friend. This formula is easy on the digestion and very tasty. Your puppy will undoubtedly enjoy every bite. The great thing about it is that it features minerals, vitamins and added DHA for balanced and complete nutrition. We need to mention that it contains only natural ingredients with no artificial preservatives, flavors or colors, no meat-by-products, soy, corn or wheat. 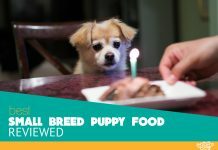 Overall, this great recipe provides whole-body nutritional support and is made with unique ingredients that will boost your puppy’s immune system. It also supports his healthy muscles growth, optimal nutrient absorption, vitality and energy, healthy brain development and bone strength. Let’s face it, small pets and puppies need more than just a little kibble. They have a more intense and shorter growth period, and they need more than large canines. Also, Boston Terriers have a more finicky appetite and more energy than some bigger pooches. That is why they need proper food to support their energy needs. This Royal Canin puppy food features a fantastic mixture of nutrients to promote digestive health, while a patented combination of probiotics and antibiotics boost his immune system. It also includes all the vitamins, minerals and antioxidants that your little furry friend needs. Tasty, small sized kibble is made for picky appetites and tiny teeth while promoting well-being and overall health. Intensified energy content will support your puppy’s higher energy requirements. Whole Earth Farms dog food is specially made for puppies. This amazing nutritious meal will offer all natural ingredients at a good value. The best part is that these canned recipes are designed in the USA, and deliver a balanced and complete diet for your canine. It doesn’t contain soy, wheat, grain or corn, which is excellent for a dog who have sensitive stomach. But on the other hand, it features all the minerals, vitamins and antioxidants your pup needs. These will help support healthier skin, stronger nails, increased energy, shinier coat, less shedding and more comfortable digestibility. 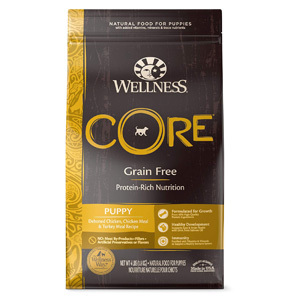 This puppy food is designed to meet the required levels of your dog’s nutrition. AFCO Dog Food Nutrient Profiles for All Life Stages have established these levels. The all-natural, premium, high-protein, grain free formula comes in both small breed puppy and puppy recipes. It has authentic, pure and simple ingredients which will help you provide a long, happy and healthy life for your canine. It is made with salmon oil, turkey, chicken and vegetables, and fruits to help boost your furry friend’s immune system. We need to mention that it is fortified with minerals, vitamins, probiotics, and antioxidants that will provide the right amount of nutrition. It included phosphorus and calcium for teeth and bones and added DHA for eye and brain development. And the best part is that its natural ingredients are delicious, so we are sure that your little dog will adore it. Whole Earth is a great option for pet owners interested in exploring natural dog diet. Your pal will get healthy ingredients mixed into a very tasty meal. The Natural Balance dog food is a fantastic choice for every dog parent as it will eliminate common allergy triggers. Its first ingredient and main protein source is duck meat which is excellent in rebuilding your pet’s immune system. It doesn’t contain artificial colors or flavors, and it is free from grain with limited carbohydrates. Its high-quality ingredients will support your dog’s overall health. Balanced Omega-6 and Omega-3 fatty acids will help him to maintain a shiny coat and healthy skin. And because of the animal protein source, the recipe is an ideal choice for those pooches with food sensitivities. Potatoes are a highly digestible energy source and a premium quality carbohydrate. The kibble is shaped explicitly for tiny teeth, and it features Salmon Oil and DHA that will support the development of your furry friend’s neural system. Older canines can experience some aging problems such as sensitivity to a particular food, memory loss, and mobility issues. The Nutro Wholesome Essentials recipe will help older dogs to replenish antioxidants as they age. It also features DHA, ALA and omega-3 fatty acids for cellular and brain health. B vitamins, zinc, and 6-fatty acid promote shiny, soft coat and healthy skin. This formula is designed with oatmeal, whole brown rice, and real chicken, which means that it is tasty and easy to digest. The great thing about it is the benefit of naturally sourced chondroitin and glucosamine that will help keep your four-legged friend’s joints healthy and strong. Nutro’s experts have created this recipe to promote health condition and life stage of your older canine. They only use natural, GMO-free ingredients. Boston Terriers are small-sized dogs and have muscular, compact and short frames with graceful and well-balanced postures. They are famous for their short tails, strong limbs, board chest, and arched necks. Their fine, smooth coats come in black and white, seal and white, or brindle and white. Interesting fact about them is that they are less excitable than other terriers and have gentlemanly, well-mannered and a gentle personality. Their keen intellect makes this breed eager to learn and easy to train. Bear in mind that they also have some common health issue such as allergies, heart problems, and cataracts. This healthy canine can live as long as 16 years. When determining the proper dog food for your pooch, you need to consider some factors like his activity level, metabolism, age, and size. That way you will know how many calories you should give your pet daily. According to the National Research Council of the National Academies, an average sized Boston terrier should exercise regularly and consume about 660 calories per one day. On the other hand, the puppy needs about 436 calories per day. When you choose the right pet food for your canine, you can give him a meal that is made for medium or small-sized breeds. Of course, that depends on your dog’s size. We need to mention that puppy foods that are designed for smaller dogs are a great option for them since they provide minerals, vitamins, and calories needed for their early growth. When your four-legged friend reaches his fully grown size, you can switch to formula for Boston terrier adult. It doesn’t matter whether you choose lamb, fish, beef, or whole chicken in your dog’s food, your primary nutrient should always be protein. Before purchase the right meal for your pet, you should check the label to see if the first two or three ingredients are one of these meats. It will be easy for your puppy to digest it. Carbohydrates are a great source of energy, and they are easily digestible. Although your dog doesn’t require them, you should add them to his diet. And if you want a low-glycemic alternate source of this nutrient, you could use sweet potatoes. The best thing about these ingredients is that they provide great nutrients your dog needs for better overall health. They provide antioxidants, additional protein, minerals and vitamins for your furry friend. Your canine might not require them, but they are more than useful in his diet. Fat will offer your dog omega-3 fatty acids for shiny coat and healthy skin. It is a high nutrient that also provides energy for this breed which they need. It features DHA that is great for eye and brain development of your puppy. Caloric intake needs are the same between females and males of this breed due to their size that is very similar. Adult canine should weigh around 20 pounds which means he will need 650 calories per day. But you should be careful how are you feeding your senior dog because they are less active and can gain weight much faster than younger pooches. That is why you need to drop his daily intake of calories and exercise with him as much as he can. This also applies if your pet is neutered or spayed, regardless of his age. On the other hand, if your furry friend is very active, you need to increase the daily intake of calories for him. As we have mentioned earlier in this article, when you are deciding how much food your dog should consume, you need to consider his age, size, health, weight and activity level. For the first several months of their life, young small breed puppies can consume food 4 or 5 times per day. And if your terrier is an adult, then you should feed him 2 times a day. For a majority of Boston Terriers, a change in their diet is a great way to treat allergies. Probiotics are safe to use, can reduce the development of this condition and they are relatively inexpensive. You should also consider including Omega-3 fatty acids and healthy fats to your dog’s diet. These nutrients will play an essential role in treating the discomfort of skin allergies and prevent them. You could also incorporate freshly milled flax seed or fish oil into their meal. Find the right meal for your furry friend and look for those foods that don’t contain wheat, soy or grain. Before choosing the right dog food for your canine, you should talk with your vet about special recommendations. Here are general tips that will help you pick a perfect meal for your furry friend. Combine different kibble textures and shapes. It will be easier for your dog to chew this food. Dry kibble that is odd-shaped is a better choice than a ball-shaped one. It is easier for your terrier to pick it up. Feeding bowl that is tilted and raised is the best choice for your pet. It will position the meal optimally for your puppy to pick it up and chew it. The transitioning process to new food is not a hard task; you just have to know the right way to do it. What you need is a good plan to do so, and the right dog food for your growing puppy. Bear in mind to feed him with the food that has lots of nutrients that will boost his immune system and body development. Plan this process over one week and gradually providing your pup with more of the new meals and less the old ones. Slowly increase new food every day until he is only consuming that. What are some homemade dog food recipes for them? You can provide your dog with a much higher level of nutrition if you start to make him healthy and fresh food that will work with his digestive system. There are many great homemade foods for this breed. Some of them are Doggie Beef Stew, Turkey and vegetable dinner, doggie meatloaf, and chicken casserole. What can they eat if they have gas pains? Look for low fiber content and natural ingredients in dog food. Some owners preferred to feed their canines a diet of rice, potato, and meat that they made themselves. Bear in mind to avoid artificial preservatives, fillers, chemicals, and ingredients. Is raw diet safe for them? Yes, raw food is safe for your Boston terrier. In fact, it offers many more benefits that some commercial pet foods cannot provide. You will notice that many health issues of your pup will disappear, his fur and skin will improve, muscles will develop, and he will maintain a healthy weight. What is the best dog food brand to those who have a sensitive stomach? There are a lot of dog food brands that includes antibiotics and probiotics in their formulas to help your dog digest it easily. But we have to mention Wellness Natural Pet Food which is an excellent option for a pet with a sensitive stomach. Their formulas don’t contain artificial preservatives, flavors or colors. As one of the most adorable canine breeds, Boston terrier has found his way into the heart of every dog lover. They are protective of their parents, loving and easy to train. That is why they are one of the most popular breeds in the world. And in this article, you will find everything you need to know about what and how to feed them. Read our reviews to find out more about the best foods for these dogs and what benefits they are offering.